People inspect the damage at a site hit by airstrikes, in the rebel-held area of Aleppo's Bustan al-Qasr, Syria April 28, 2016. U.S. Secretary of State John Kerry wrapped up a hastily planned 20-hour visit to Geneva Monday, saying the United States and its partners are discussing "several proposals" to stop the spiraling violence in Syria. The U.S. diplomat did not say what the proposals are. But his aim has been to restore a partial truce and stop the attacks by Russian-backed Syrian government forces that have killed hundreds in Aleppo over the past 11 days. News agencies quoted U.S. officials who requested anonymity as saying the United States is considering mapping out "safe zones" marked by "hard lines" that would provide refuge for civilians and members of the moderate opposition. Getting Russia’s support has been key but elusive for Kerry, who has called for Moscow’s help in getting Assad’s forces to stop their assault on rebel-held parts of Syria’s largest city. "There are several proposals that are now going back to key players to sign off," Kerry said after his meetings Monday with his Saudi counterpart, Adel Al-Jubeir, and the U.N. special envoy for Syria, Staffan de Mistura. "We are hopeful but we are not there yet," Kerry said, adding the U.S. and its partners "are going to work very hard in the next 24 hours, 48 hours to get there." Kerry said an agreement on Aleppo could be announced in the coming days. Russian Foreign Minister Sergei Lavrov did not attend the talks, complicating Kerry’s efforts in Geneva. Kerry said he would speak by telephone with Lavrov. De Mistura was due to go to Moscow on Tuesday. For the United States, it is important to show it has not given up on resolving the five-year-old conflict, but there are questions on whether a low level of U.S. commitment has resulted in a Russian victory in the region as the Russian-backed Syrian government forces retake large swaths of land. "We’re in a kind of phase in the conflict where there are ongoing battles for advantage happening," David Butter, a Middle East analyst at Chatham House in London, told VOA. "Of course, the momentum is very much on the Assad regime." 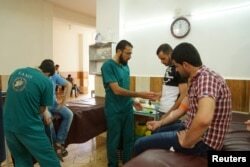 Medics help men donating blood during a campaign to supply blood to a hospital in the rebel-held town of Dael, in Deraa Governorate, Syria May 1, 2016. Kerry arranged the trip after it became clear the humanitarian situation in the city was deteriorating rapidly and as proximity talks between the Assad government and the moderate opposition failed. Scenes of escalating violence and atrocities committed against civilians are an opportunity for the United States to demonstrate a leadership role in resolving the conflict, analysts say. As Syrian forces prepared the latest assault on Aleppo two weeks ago, Russia had successfully portrayed the efforts as a counter-terrorist operation to strike at the al-Nusra Front, which the United States and Russia consider a terrorist group. Analysts note that U.S. officials, intentionally or not, were interpreted as being unopposed to the Aleppo operation before it began. U.S. military officials were quoted as saying the al-Nusra front was a major dominant force in the city and "not part" of the cease-fire. The perception changed when an airstrike hit Aleppo’s al Quds hospital, a facility supported by the group Medecins Sans Frontieres, or Doctors Without Borders, killing several children and medical staff, including one of the city’s remaining pediatricians. The incident outraged Kerry and analysts say it was an opportunity for the U.S. to step up its efforts to change any perception that it was not taking an active enough role in resolving the Syrian conflict. Demonstrating the U.S. administration’s commitment to fulfill promises remains a major task for Kerry. "(President) Obama set the tone by talking quite a big game on Syria, but not having any strategic commitments. Because the U.S. hasn’t really invested, it’s got much to lose except as a non-actor," said analyst David Butter. Jasmine Gani, an analyst at the Center for Syrian Studies at the University of St. Andrews in Scotland, told VOA that perceptions of U.S. legitimacy in the region hang in the balance as a result of what she calls a "mismatched rhetoric and policy." She says Washington raised expectations by calling for Assad’s exit early in the conflict and then failed to provide the support needed to carry out that aim. With Russia now figuring strongly in the equation, Gani said the U.S. "has to be a lot more careful as to what it puts its commitment to. In the past, it was not such a problem, but the shift of dynamics in global power means there is greater scrutiny on the United States to fulfill its promises."